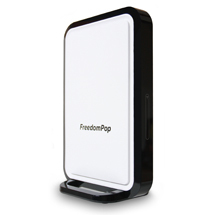 FreedomPop’s home broadband service goes live. Can you survive on 1 GB a month? FreedomPop launched its home broadband service on Wednesday, taking the freemium model it uses for mobile data to the residential broadband market. FreedomPop is offering 1 GB free of charge to any user who signs up for service and buys its $89 home WiMAX router. Anyone who does more than check email on their home PC is surely going to use more than a single gigabyte in a 30-day spell, but as with its mobile service, FreedomPop is offering ways for users to earn more free data and selling premium data plans with bigger buckets of data. The bottom line though is heavy home broadband users aren’t going to sign up with FreedomPop – these plans aren’t designed for Netflix(s nflx) or file sharing — but the virtual network operator is making a compelling case to casual data users, selling home connectivity for as little as $10 a month. FreedomPop is offering four tiers of service, all of which tap into Clearwire’s(s clwr) WiMAX network available in 70 cities (as an MVNO FreedomPop resells Clearwire’s WiMAX capacity today and will soon resell Sprint LTE connections as well(s s)). The first tier costs nothing, giving customers 1 GB of monthly data with speeds throttled to under 1.5 Mbps. Every additional megabyte beyond the one-gig cap costs a cent, so going way over that cap could be a mighty expensive proposition. For instance, Streaming a 2 GB HD movie would cost you an additional $20. But FreedomPop is being perfectly up front that this plan is meant for basic web surfing and email. In any case, the low-speed connection would prevent you from engaging in many bandwidth-sucking activities. As with its mobile service, FreedomPop allows free users to earn more data in 50 MB chunks by engaging the FreedomPop social network, using FreedomPop’s IP services and participating in promotions. It’s not yet clear if FreedomPop will allow customers to share their unused data with other home users like it allows mobile users to swap megabytes. The next tier up is a $10 monthly plan, which ups the cap to 10 GB while keeping speeds limited to 1.5 Mbps. From there, the cap stays at 10 GB, but for $5 or $8 more a month you can boost speeds to 3 Mbps and 8 Mbps respectively. In the paid tiers, FreedomPop is charging a half-cent for every megabyte overage. Even still, 10 GB isn’t much for a home connection. In July, my colleague Stacey Higginbotham took a detailed look at how different households consumed broadband, and found even sparse users of streaming services still consumed well over 10 GB each month, to say nothing of 1 GB. But once you turn off that multimedia spigot, usage drops considerably. Stacey interviewed one user in Atlanta who averaged 500 MB a month for three straight months when she took a hiatus from streamed video. You might think of these of your grandparents’ home broadband plans (though in this day and ages, grandparents are becoming increasingly sophisticated in web communications tools), but FreedomPop seems to be positioning as a means of bridging digital divide, offering cheap, and even the possibility of free, service to people who normally couldn’t afford home broadband or just want minimal connectivity. There are still millions of dial-up users left in the U.S. It would be interesting to see if FreedomPop can reach them with this service. One of the here-to-for unspoken potential applications for Freedompop’s “free” 500 mgb and 1 GB plans is VOIP. Most voip services – such as MagicJack and NetTalk – utilize and require *very* little bandwidth, and 4g speed is generally adequate for such a purpose. Consequently most such consumers could probably get by with using the free Freedompop plans if used solely for such a purpose. Thus, telephone service could conceivably be obtained for nothing more than the up-front cost of their VOIP device and Freedompop hardware plus the $20-$30 per year cost of the VOIP service. Even people who need the more traditional Internet services provided by cable and DSL providers (for much more demanding applications such as video streaming, web browsing, and file uploading/downloading) could conceivable benefit from adding on Freedompop’s free (but limited) Internet service for exclusive VOIP use , as doing so would eliminate VOIP service degradation currently experienced by simultaneous use of more demanding and bandwidth-hogging services. What are the other 2 top tiers of service? The link to Freedompop’s website just links to their welcoming page.